In the winter of 1946?47, a shepherd boy threw a stone into a cave, hitting a clay jar and uncovering one of the most significant archaeological discoveries of modern times: the Dead Sea Scrolls. Though the saga of the discovery has been told and retold many times, less attention has been paid to how the events have unfolded over the decades. In this accessible and illuminating work, one of the world's foremost Dead Sea Scrolls scholars?and one of the first women to actually see the documents?reflects on the most significant learnings about these ancient documents of faith. Inviting her readers into the many controversies that have surrounded the scrolls and their publication, Eileen Schuller provides an authoritative overview to how the discovery and study of the Dead Sea Scrolls have sharpened our understanding of the early Jewish faith, including the Jewish religion that served as the foundation for early Christianity. - Publisher "Here for the first time is Eileen Schuller's expanded lecture series, given as the John Albert Hall lectures at the University of Victoria in 2002. Beginning with the question, what have we learned from the Dead Sea Scrolls, Eileen Schuller presents a discovery made over 50 years ago, that everyone has heard at least something about already, and takes the reader through, decade by decade highlighting key events and accomplishments in scroll scholarship." --BOOK JACKET. About "The Dead Sea Scrolls"
"Here for the first time is Eileen Schuller's expanded lecture series, given as the John Albert Hall lectures at the University of Victoria in 2002. 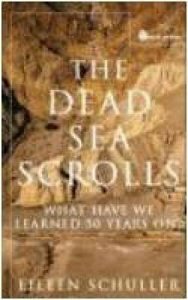 Beginning with the question, what have we learned from the Dead Sea Scrolls, Eileen Schuller presents a discovery made over 50 years ago, that everyone has heard at least something about already, and takes the reader through, decade by decade highlighting key events and accomplishments in scroll scholarship." --BOOK JACKET.